With the Oscar winning film “Green Book” now available for home viewing we though it would be interesting to note that Cedar City was listed in this travel guide. For those who are unaware of the Green Book, it was a travel guide for African-American tourists that allowed them to plan vacations avoiding segregated hotels, restaurants, and other public accommodations. The book was first published in 1936 by Victor Green, a postman, and distributed largely by mail and sold at service stations, primarily Esso stations. This was because Esso not only served African-American customers, but they were willing offer franchises to African-Americans as well. AAA and the United States Travel Bureau also distributed the Green Book. The guide was published until 1966, when legal changes eliminated certain segregation laws. The following image is from the 1959 edition. 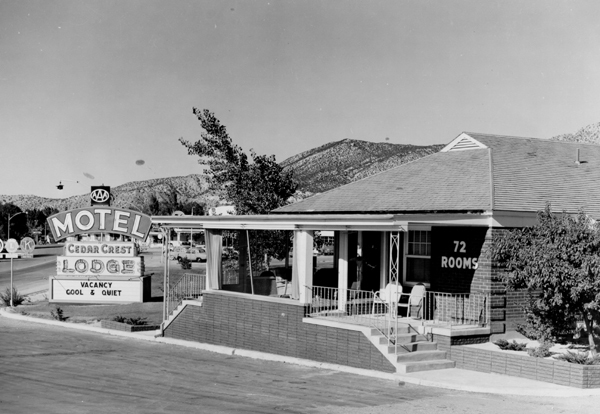 The Cedar Crest Motel sat where Smith’s grocery store is today.